Hello dear cattledogs readers! My name is and I am a stylist, artist and vintage shop owner based in Germany. Holly’s blog has always been a constant source of inspiration to me and I am honored to be part of the amazing team of cattledogs now! In my monthly flower column for cattledogs I will create seasonally appropriate floral arrangements that will hopefully inspire you to bring the outdoors into your home too! Before I share my first arrangement with you, I’d like to tell you a little more about my philosophy. For my arrangements I love to use what my surroundings offer. For me, a house doesn't feel like a home without flowers and plants! This is also the reason why you always find natural elements in my home, I never come home empty handed from my walks in the nearby forest. I love to challenge myself and try to stick to the changing seasons to reflect the nature of the season. Of course there are occasions where only a lush flower arrangement makes sense but I also think that branches can make a huge impression and almost look like beautifully arranged sculptures. We are in the middle of a gloomy winter here in Germany and instead of going for an arrangement with a lot of flowers that will fade in a week’s time, I decided to go with a huge wreath that can stay up on the wall for a few weeks. As I can’t change the weather, at least I wanted to change the mood in my studio and I knew, I wanted to go for a fresh look with lots of juicy greens as they add an airy / lively look to every home. 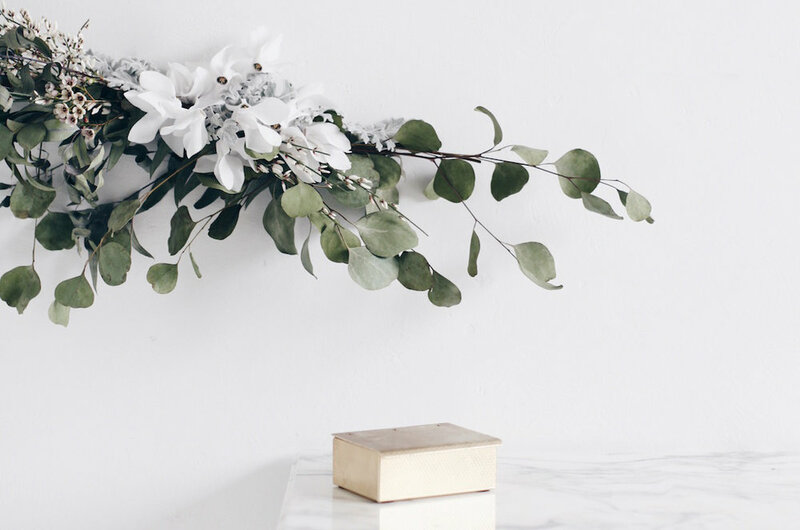 Once you notice it’s not too difficult to make these stunners, you will enjoy them for weeks as you can hang them just like that to freshen up your interiors, use it for a winter wedding backdrop or decorate for a winterly inspired birthday party! Now, I will show you two different ways to style the wreath and I promise the DIY steps won’t be too difficult! So you can go ahead and try to make this wreath for your home too! The foliage used here looks amazing once it has dried so I went for a lot of eucalyptus and ruscus-leafed bamboo. Because I didn’t use a lot of ingredients, I decided to work with scale to create a grand effect! To give the wreath wings a proper form, I attached the branches little by little to huge semi-circle branches. In the beginning I made sure to stay close to the circle form of the solid branch that made the basis. I used thin floral wire to attach the branches to one another. I cut the wire in small pieces because I didn’t want to get too tangled up. Once you have made the circle form of the wreath wing, you are allowed to get a little messy here: you can attach the branches pointing in every possible direction! Add some flowers or anything you fancy, for instance in the first wreath I've added some seasonal flowers like Dusty Miller, White Cyclamen and Chamelaucium (wax flower). When finished, I fixed them to the wall with transparent fishing wire. Note: If you are planning on having these wreaths up for a few days or weeks, you can also attach paper flowers to the wreath. Kicking perfection to the curb is key here, as this disarrangement will add lots of interesting structure to your wreath! Seriously, don't work too tidy and you will get a breathtakingly beautiful result! I hope you liked my wintery arrangement and are inspired to make one yourself! I will see you in a month and please don't hesitate to drop a comment on your future flower arrangement wishes.To celebrate the beauty of wreaths I even started a challenge called #wreathofthemonth on Instagram. Please share your wreathstacular pieces in the comments section below with a link OR on IG adding #wreathofthemonth #decoratewithflowers.